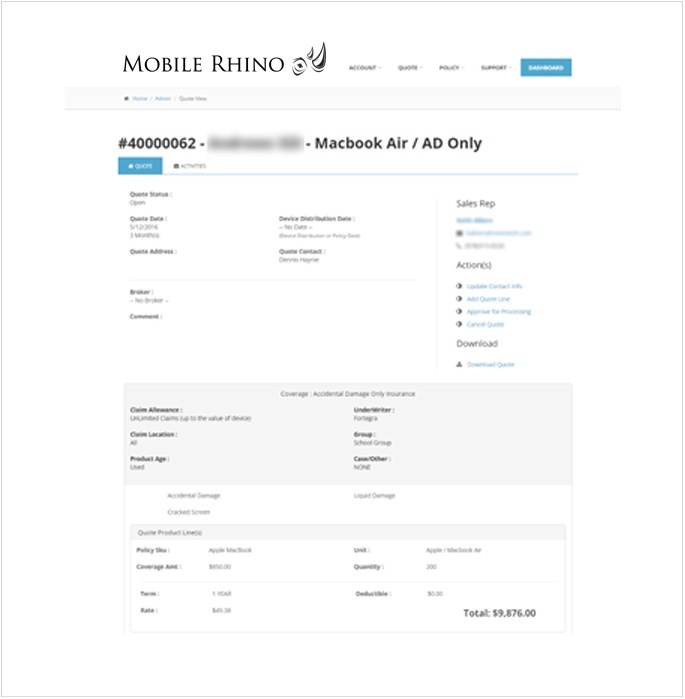 Mobile Device Protection for Enterprise and Education. 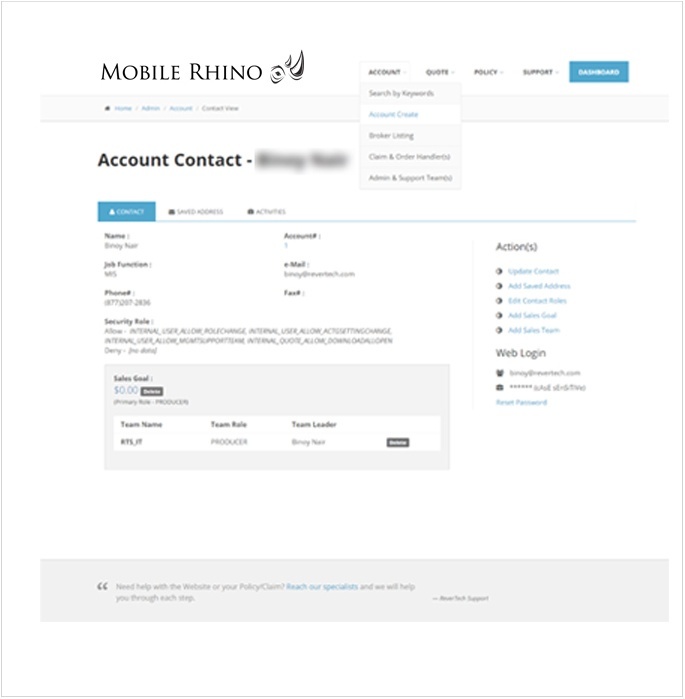 Mobile Rhino is desinged by educators for the educational market. We can match the unique needs of your public, private or higher education institution. Open a claim and get your devices repaired quickly through a certified repair facility. Once the claim is opened you can view the status of your claim. Choose the plan that best fits your needs: Full Protection including loss and theft, warranty only, repair service with no protection or simply purchase parts that wholesale rates. It's all about getting the device back into the students hands. We have 4 claims facilities that that specialize in different device types. Onsite repair service is available, too. Windows (tablet), Mac OS X, iOS, Android or Chrome Devices, etc. All of these devices and more are eligible. Our most popular plan has a $0 deductible. If that doesn't fit your needs, you can choose a $25, $50 and $100 option. 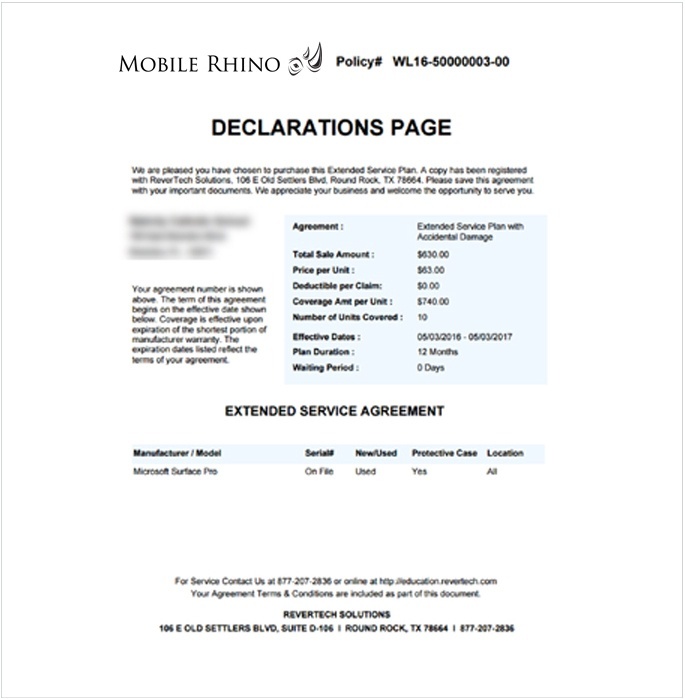 This is the first mobile device protection plan to be offered through local licensed professional insurance agents. The same trusted partner that is currently helping you. Our quotes will include guaranteed buy-back prices for 1,2,3 and 4 years. We can also offer asset recovery assistance at any time. Full resource protection includes claims resulting from loss, theft, vandalism, fire, flood or wind. On average, 30% of your claims will be from loss and theft. Losses included are liquid submersion, cracked screen, accidental damage, mechanical malfunction, electrical malfunction or manufacturer defect. If you choose not to transfer the financial risk of your digital device program to an insurance partner then you can try our Repair Only plan. Our services is among the fastest and most cost effective in the industry. Try our Part Only Plan if your organization employs your own tech repair staff. We can give wholesale pricing on an extensive range of products. The world of laptops is filled with different sizes, styles, operating systems and options. We can repair/replace the oldest windows laptop and the newest Mac OS based machines. We can even include coverage for your desktop towers. Network and graphics cards, processors, CD or DVD drives, etc. Have smartboards, printers, scanners or other devices? We can help there, too. Login and submit a claim at your convenience 24 hours a day, 7 days a week. No printed forms to complete, no red tape. Once the claim is submitted you can use the portal to view the status of the claim. Our job is to get the device back into your students hand quickly. Add and substract devices, change serial numbers or view your insurance documents, all from within your own device management portal.